A few weeks ago I attended a “Winter Salon” at Hedgebrook, a literary nonprofit that supports women writers. I went up for the day, took classes, listened and learned. I keep trying to describe the day to people and keep falling short. It seems no matter what I say, I can’t accurately describe the feeling there. So I’m going to try again and start small. Very small: pomegranate arils. After lunch, the teachers talked about women writers supporting women writers — how elevating one elevates all. As the conversation unfolded, I looked around the room. There were writers there, like me, scrambling to figure out a path in this weird, wordy world. There were writers who’ve been published many times over. There were white-haired writers who didn’t care an ounce for the career portion of things — they were there for the love of writing. I’m lucky — so lucky – to have people in my life who take my writing seriously. My husband helps me carve out time and space to write. My parents always ask how the book’s going (usually with a kick-in-the-pants from my dad). My best friend encouraged me to start this blog. Sometimes I’m not sure I take it seriously. Don’t get me wrong — I work hard. I get up early and write and I participate in writing group and I spend time (and money) to attend workshops. But when people ask me about my work — I stutter. I stammer. I mutter something innocuous and turn the conversation. I don’t feel like a “real” writer because I’ve never had my name in print. It doesn’t pay the bills. It feels like a hobby, something done in secret. So I’m trying to embrace that. To that end–I’m changing the name of this blog, to my name. I’m not hiding behind a nom de plume anymore. You can find it now at ldoxford.com. I am a writer. These are my stories. It’s like Kanye’s plan, but with a lot less crop tops and a lot more word count. Like I mentioned in last week’s post — I haven’t been writing much lately. I’ve gotten out a few short stories that I feel good about, but what I REALLY need to be doing is editing the 2nd draft of my book. I’ve puttered away at it, but haven’t succeeded at getting down to business. I know I work better with structure. I need deadlines. But sometimes creating those for yourself… the motivation, it’s lacking. Last week my friend Jay introduced me to a site called Pacemaker. In a nutshell: you put in your writing goals and deadlines, and Pacemaker spits out a plan. 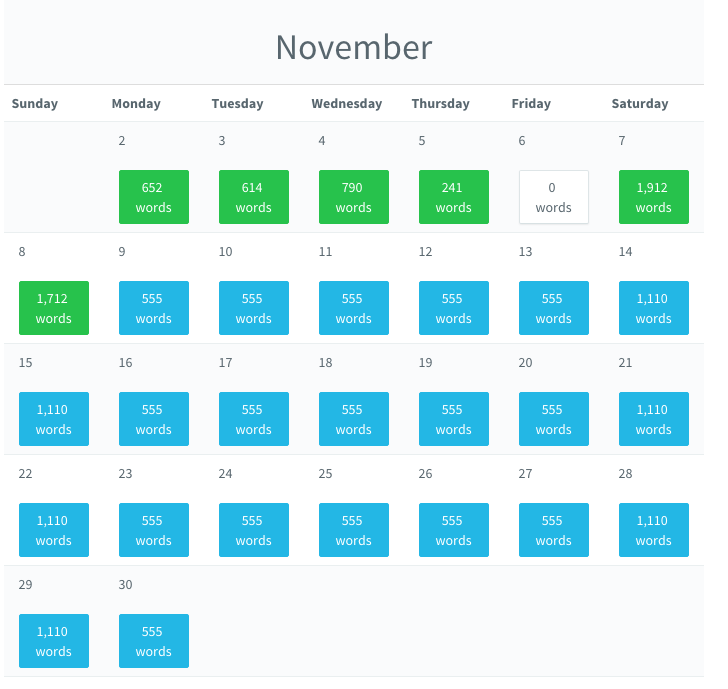 The exact number of words per day you need to write (or edit) in order to hit your goal. So I thought… what would it look like if I made a goal to finish the 2nd draft by the end of this year? And you know, it’s not too shabby. About 550 words on the weekdays. A little over 1,000 on the weekends. December looks the same. Totally doable. And I’m doing it. As you can see, I’ve already missed one day–but that’s ok. Not beating myself up over it. I made it up on the weekend, so we’re still on track. Breaking it down day by day, word by word, makes the goal look much more reasonable. More attainable. 550 words a day doesn’t seem scary. (On a good day, I can get that done in the morning before leaving for work.) The vision of having that 2nd draft printed up and piled up on my desk — it’s taking shape. You just have to start. One word at a time.